Go underground and discover why the beetroot is a delight worth unearthing. Beetroot is a root vegetable with dark purple skin and firm flesh. It has a rich, earthy flavour with a mild, bitter edge. 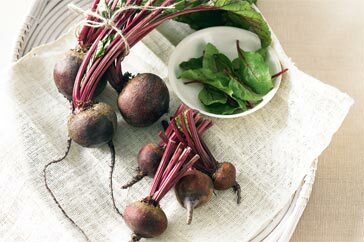 Baby beetroot is smaller and sweeter than the regular variety, and is ideal for salads. Beetroot leaves can be used like spinach, cooked on their own as a side dish, or in soups, salads and sauces. Choose beetroot without splits, and with leaves and stems intact. When cutting beetroot stems, leave about 3cm of stem attached, or the colour will bleed. Wear disposable gloves when preparing beetroot to avoid staining your hands. Store beetroot in a cool, dark place for up to three days, or in the crisper section of the refrigerator for up to 10 days. Beetroot is high in fibre and folate and contains manganese, vitamin C and potassium. The bright purple colour is from antioxidants called betacyanins that may help prevent high blood pressure and protect blood vessels. Beetroot leaves are rich in vitamin K and the antioxidant beta-carotene.